Thank you for taking the time to visit the Johnnie Jumper Farm website. If I can help you in anyway my number is in the contact tab above. I hope that you find this information helpful about our farm, bloodlines, and breeding program. Johnnie Jumper passed away on November 2, 2011. It was a very dark day in the gamefowl world. Johnnie was respected world-wide for his expertise in breeding some of the strongest, unsurpassed gamefowl in the industry. 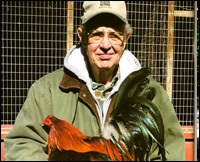 He took pride in raising the finest birds and he devoted his life to his gamefowl and his family. Those who knew him knew that although he was a legend, he never let it change him from the humble farm boy where he began. Johnnie grew up in a household of ten children. It was meager in material wealth, but rich in love and dedication. He was taught values from an early age and he never forgot where he came from. He was honest to a fault. In business, he would never sell anything that he considered to be less than the best. He looked at everyone equally. He didn't care if you were a congressman or a convict. If you were his friend, he loved you and most everyone he met was his friend. If there was anything Johnnie Jumper loved more than chickens, it was his family and friends. And if there is any consolation in his passing it is that he left a bloodline of family to take care of his bloodlines of chickens. All of Johnnie's possessions (business and personal were left to his wife and family). All of his brood fowl was left to his family. Upon Johnnie's wishes, Randy Jumper (son) and Nathan Jumper (grandson) are running the Jumper fowl farms in Mexico and the United States. It was Johnnie's wishes that his family carry on the business. With heavy hearts this is being done. Randy has had a continuing business in Mexico for many years. Nathan, (along with a family friend/ employee of thirty years) is continuing the farm in Mississippi. They have made it their goal to combine their knowledge and ambition to continue the legacy that was left to them. Jumper farms will remain in the Jumper family. The business will be continued in the same fashion as it always has been, with honesty and integrity. It will be continued according to Johnnie's wishes that his offspring take on the business and keep his bloodline going. Johnnie Jumper will live on through his bloodline, as his brood fowl has done… from generation to generation.